A white envelope. A reference to ‘Her Majesty’s Courts and Tribunals Service’ on the back. 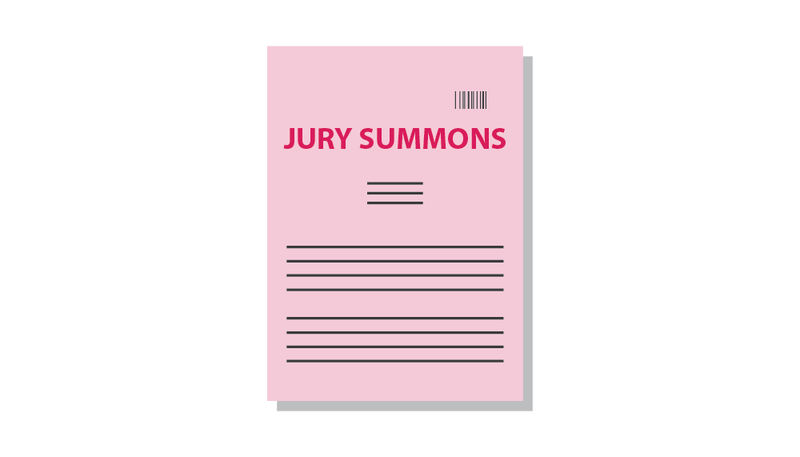 Inside there is a pink letter with big bold letters: jury summons. That’s how it starts. In 2018 I served as a juror on a long court case at a crown court in London. Think several months, rather than days or weeks. Although it was fascinating to catch a glimpse of the workings of the criminal justice system, the overall experience was bizarre: never before have I been part of something that is so simultaneously passive and important at the same time. You must attend for jury service as [name and address of court]. Starting on [date] at [time] usually for up to two weeks. You may be committing a criminal offence punishable by a fine of up to £1000 if: you do not respond to this summons without a reasonable excuse; you do not attend for jury service without reasonable cause; when your name is called, you are not available to be a juror without reasonable cause; when your name is called, you are not fit to serve because of drink or drugs. The language in the letter is somewhat intimidating (‘WARNING’, ‘you must’, etc. ), which is one of many reasons I’ll refer to it as ‘jury duty’ rather than ‘jury service’. An allowances leaflet clarifies how you can claim expenses during your jury duty (travel costs are covered) and how you can claim money for any loss of earnings or benefits (no, not all employers pay you during your jury duty, which means many have to survive on what they can claim). An envelope and form are enclosed, which you need to return to the Jury Central Summoning Bureau. If you have anything planned during the two week period of your jury duty, such as a wedding or holiday, you can postpone your jury duty and do it at another time within the next 12 months. A few weeks later you will receive another letter: confirmation of jury service. A day before you are supposed to show up at court you receive a text message reminder – the first and only sign that the courts have been modernised in some way (for insiders: they use GOV.UK Notify). The time has come. You arrive at the court you have been appointed to. Depending on the size of the court and the types of cases it handles there may be photographers and barriers outside. You will have to go through airport-like security every time you enter the court. Once inside you will be guided to the jury assembly room, where you and dozens if not hundreds of others will be given instructions. This introductory talk covers the basics: travel expenses, lunch expenses, do not look up any of the court cases on the Internet, stick to the jury assembly room, do not talk to anyone else within the court, and do not discuss your court case with anyone. And the main message: it may take hours or days before you are assigned to a case, so until then please entertain yourself; read a book (there is no wifi). Every once in a while the people who ‘manage’ the jurors will call out a list of names. A group of people will follow an usher to a courtroom. Twelve of them will be selected by the judge to sit on the jury, and the others will return to the jury pool and wait to be called again. At this point everything is still new and strange. What is behind all these doors? How many courtrooms are there? How long will I have to wait? What is happening? You look around and see what seems to be a true cross-section of society. Whenever names are called via the tannoy everyone sits up, on edge. Some sigh, mutter, or even sleep. Others are on their phone talking about work things, clearly under the impression that they’ll be back in the office within days if not hours. When, eventually, your name is called you will have to turn off your phone. Once all phones are off, you will be led to the hallway just outside your courtroom which has exactly 12 seats. If you are assigned to the case, you will be spending a lot of time on these seats, as jury duty primarily consists of waiting. Waiting for everyone to show up to court, waiting for the judge to enter the courtroom, waiting for discussions about ‘matters of law’ to end. Once everyone is finally ready you will be led into the courtroom, which most likely looks exactly like you would expect it to look: a judge, barristers, stacks of paperwork (though there are also ‘iPad trials’), one or more defendants in ‘the dock’, and many wigs and robes. The judge will comment on the duration of the case and explain how they will proceed with selecting a jury. You may be asked to fill out a survey to establish whether there is a conflict of interest (for example because you know the defendant or other parties involved). You will also have an opportunity to briefly talk to the judge, and to make your case if you believe you are not able to serve as a juror on the case. Long cases are not the norm. When the judge in my case announced that the case in question would last several months the group of potential jurors responded audibly: many clearly could not or did not want to be away from their normal lives for that long. Those with commitments like exams and long holidays were allowed to leave, to serve on shorter court cases, and from the remaining group 12 jurors and 2 reserves were selected. I solemnly, sincerely and truly declare and affirm that I will faithfully try the defendant and give a true verdict according to the evidence. Once everyone is ‘sworn in’ the court case will start. The prosecution may provide a brief summary of the case, to give you a clue about what you are about to embark on – and then they will dive straight into the detail. The format of court cases is that the prosecution begins, outlining their case by introducing different types of evidence (photos, CCTV, phone records, maps, emails, etc.) and questioning different witnesses. Every witness can also be cross-examined by defence barristers, after which the prosecution can re-examine them one final time before the witness can leave the witness box. Once the prosecution is done, after several hours, days, or weeks, the process is repeated – but this time the defence introduces evidence (including, most likely, the questioning of the defendant(s)). While the evidence and the questions asked will give you an indication of what the barristers are trying to convey, their actual arguments will not be explicitly stated – both the prosecution and defence can only really state their case in their closing arguments at the end of the trial. As a result there is a lack of narrative and for a jury it can feel a little like they are only being shown small fragments of a movie – in a completely random order. As a juror, your sole task is to listen (though, somewhat surprisingly, no one ever asked the jurors whether they understood the English language or whether they had any hearing problems). You’ll be given a notebook and a pen, but whether you take notes is up to you. Your role as a juror is completely passive: at no point will you be able to ask any questions, clarify what was said, or do anything at all really. At this point your realise that as a juror you are simply a randomly selected pair of ears, nothing more, nothing less. For a jury the whole process is incredibly opaque: things simply happen to you. At several times during the case we were asked to wait outside the courtroom. Minutes turned to hours, hours turned to days. During that time you have no idea what is happening, or when you will be called in again. While it is understandable that timings can be tricky, the complete lack of updates clearly created resentment amongst jurors: after having been told to put their life on hold, they were now sitting in a dilapidated court doing nothing for days on end. This feeling of helplessness was particularly strong for those who were not being paid by their employers and therefore had had to rely on payments from the court (typically far less money, and the court regularly forgot to pay people). Once both the prosecution and defence have finished their cases, the judge provides ‘directions of law’ to the jury, which outline how they are supposed to interpret the law. The judge also explains that it is the jury’s task to apply the law to the evidence. Then it is time for deliberation. This is where the tables turn: now the jury is suddenly in charge, while the barristers, defendants, and the judge wait – without any indication of how much longer the jury will be. The usher will take an oath or affirmation to declare that they will take care of the jury during this period. They will then take the jury to a deliberation room: a room with a table and twelve chairs, and a hallway with toilets if you are lucky. More importantly, in my court the deliberation room had a window, which feels like a luxury after spending months in a dark courtroom. Once in the deliberation room all phones and other Internet-enabled technology will be confiscated by the usher, and he or she will lock the door. Yes, you are literally locked in. A buzzer allows you to contact the usher. Luckily, if any of the jurors smoke, you will have 2 smoking breaks a day, during which time all jurors will be led out of the room and to an enclosed outside area. At no point is the jury supposed to be apart, or in contact with the outside world, until the day is over and the judge repeats to the jury that until the next morning they are not allowed to discuss the case with anyone. As you can imagine this process can take a while when you have been assigned to a long court case. Every day you will go through the same ritual: enter the courtroom, usher takes oath or affirmation, usher leads jury to deliberation room. And the reverse will happen again at the end of the day. Nothing about this ritual is efficient, and the judge, barristers, defendants, and other court staff can be waiting for days on end for a jury to make a decision. When a decision is made everyone is called back into the courtroom and the jury foreman (someone the jury selects amongst themselves) will have to stand up and give the jury’s verdict to the clerk. The delivery of the verdict was a quite an emotional moment in my court case, the judge had to repeat the phrase ‘quiet in the dock, please’ several times, and some jury members cried. For months the process had felt clinical and detached, but during those final moments when the defendants learned about their faith the gravity of the situation was crystal clear. And then, suddenly, it’s over. A brief word of thanks from the judge (and with a bit of luck you’ll be told some extra details about the defendants that the jury was not made aware of in case it would influence their decision) and then normal life resumes. It ends as abruptly as it begins. There is a sense of relief: you are free again, you can discuss the last few months of your life with others, and more importantly: you can finally Google everyone and everything. But there’s also another side: you now know a bit more about the criminal justice system and have likely been exposed to some of the good and bad things about it. While I’m exempt from jury duty for a long period of time, I have not been able to get the experience – and justice in general – off my mind. I’d strongly recommend reading the Secret Barrister’s Stories of the Law and How It’s Broken to anyone with any interest in criminal justice.